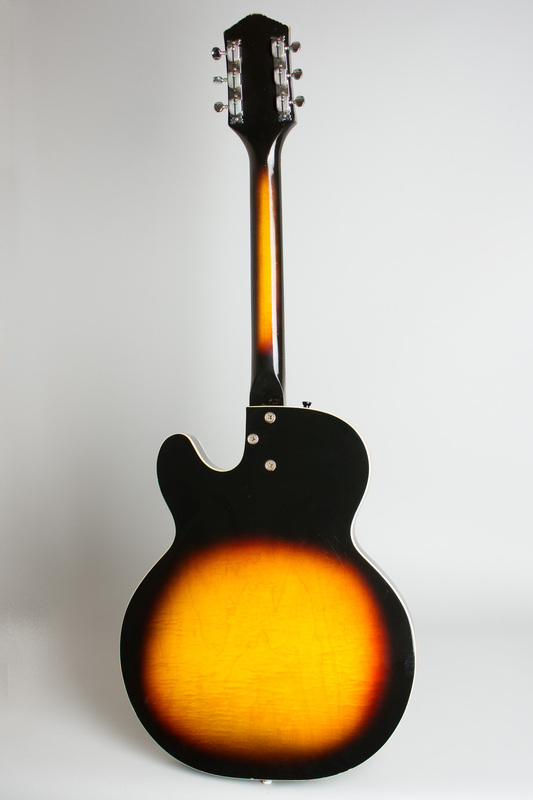 Harmony Meteor H-70 Model Arch Top Hollow Body Electric Guitar (1966), made in Chicago, serial # 9978H70, sunburst lacquer finish, laminated maple body, maple neck with rosewood fingerboard, black tolex hard shell case. 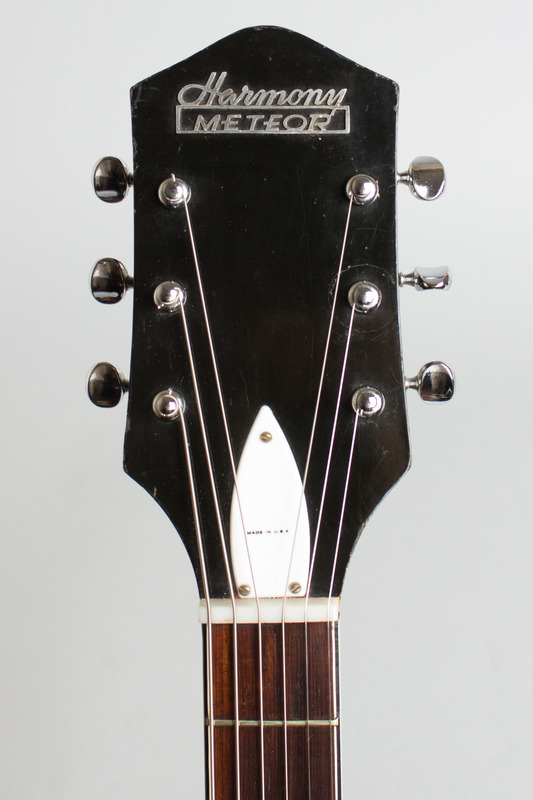 This is a fabulous mid-'60s example of a true Harmony classic, the H-70 Meteor. 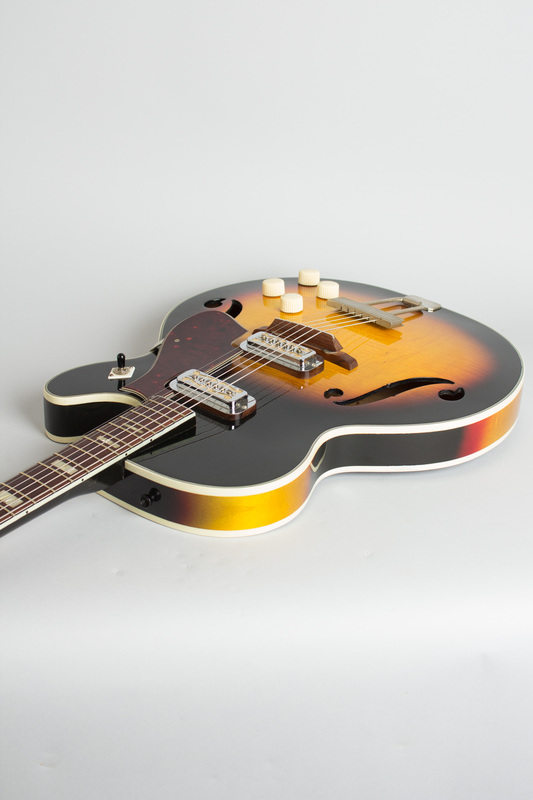 Introduced in 1958, the Meteor was the first of the thinline cutaway designs that were Harmony's bread and butter electric instruments for the next decade. 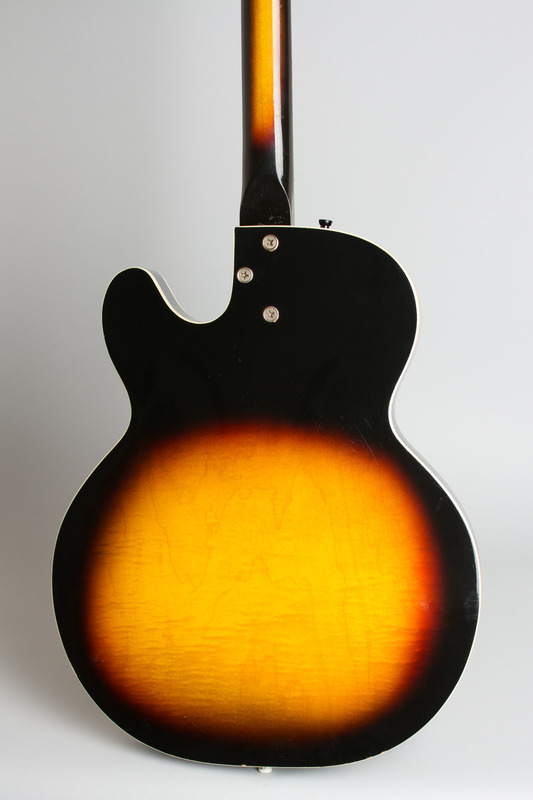 This H70 in sunburst finish is a fairly classy guitar despite its humble reputation and sold at $179.50 in 1966, without the chipboard case. With two great-sounding DeArmond "Golden Indox" pickups (introduced with this model), the Meteor is a very good-sounding instrument with a great snarl when cranked. It is wired to the scheme Gibson developed in the early 1950s: tone and volume knobs for each pickup and a single toggle for selection. The laminated maple body is 15 3/4" wide and 2" deep at the rim with a single rounded cutaway and a laminated spruce top trimmed with subtly fancy 5-ply binding. The slim bolt-on neck is multi-bound with pearloid block inlay and is equipped with the "Torque-Lok" trussrod, an under/over double rod adjusted at the headstock that is actually quite effective. The Meteor has an interesting rock'n'roll pedigree. 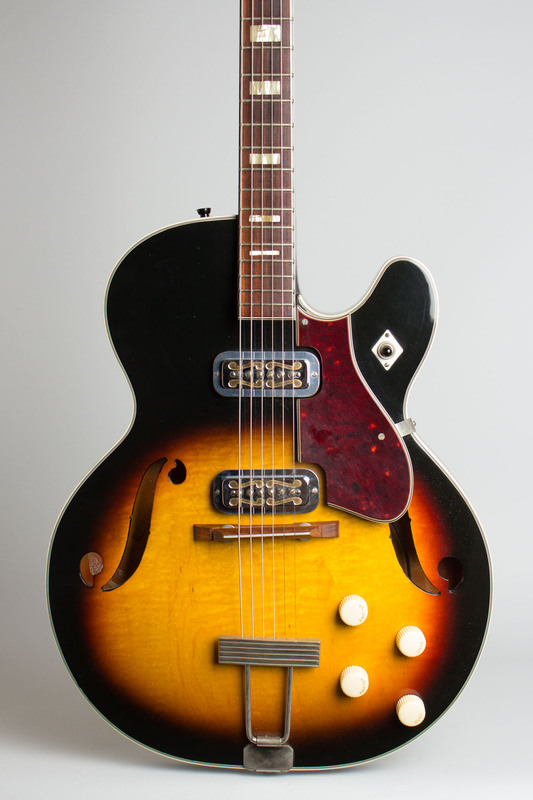 In 1962-4 Rolling Stone Keith Richards' first "serious" guitar was a sunburst H70 very much like this one, which saw extensive use on all the Stones' early records (including their landmark first album), first tours, and TV appearances. Lead guitarist Dave Davies cut The Kinks' "You Really Got Me" in July 1964 with his natural-finish Meteor; the scraping, drivingly distorted tone he achieved remains uniquely arresting even today. Davies bought the Meteor, his first "real" guitar, at Selmer's "on the hire Purchase" before the Kinks even had a permanent name. 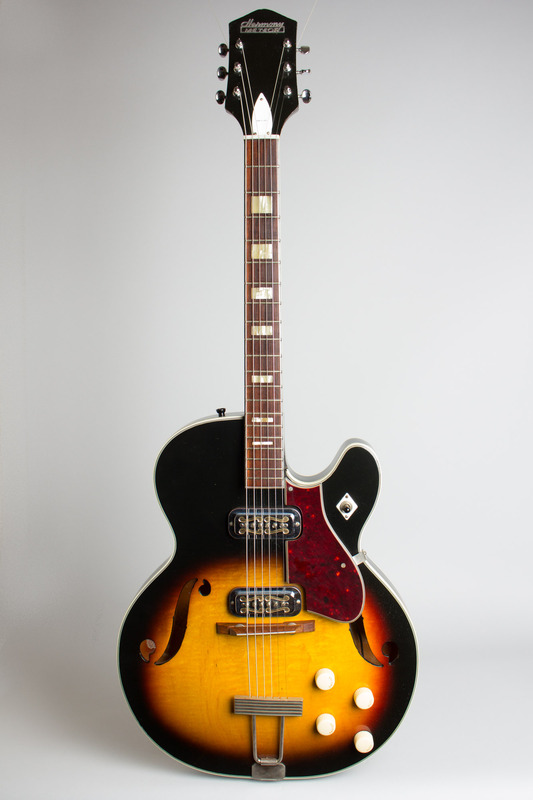 This guitar dates to 1966 and the only real difference from the first models is the addition of adjustable polepieces to the pickups, a design change made fairly early on. The Meteor was extremely popular with many teen combos and even pro players both in the UK and US in the 1960s and is still a solid performer today; one of Harmony's all-time best designs. Overall length is 40 1/2 in. (102.9 cm. ), 15 3/4 in. (40 cm.) wide at lower bout, and 2 1/16 in. (5.2 cm.) in depth, measured at side of rim. Scale length is 24 in. (610 mm.). Width of nut is 1 3/4 in. (44 mm.). A super clean original example, with little playwear and no repairs or alterations. 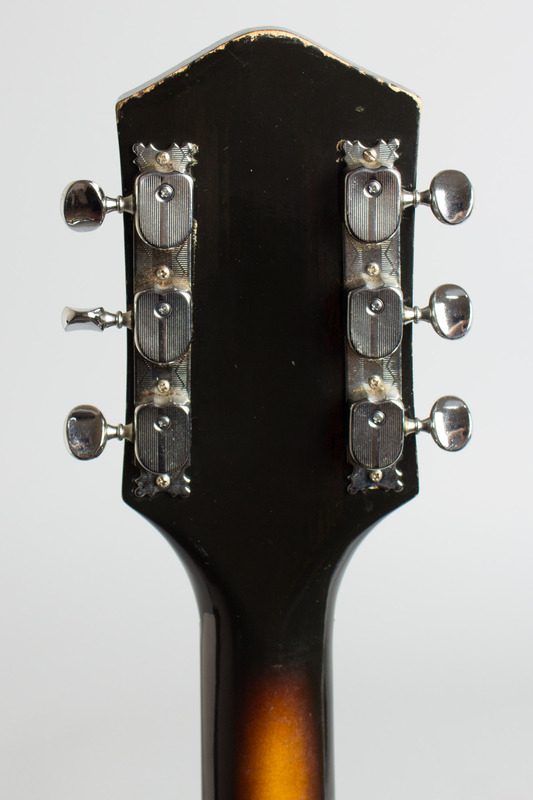 The finish has great color with virtually no fade and shows some minor dings and dents, mostly on the headstock edges. The screw holding the pickguard tip down appears to have been replaced. Other than that, as fine and original as they come; a great-playing and sounding example in a very good newer HSC. Excellent Condition.